211 Bernard: Ripe From Around Here! TONIGHT! Ripe From Around Here! TONIGHT! Tonight at 7pm! Launch at the D+Q Headquarters for Jae Steele's new book on delicious seasonal cooking, Ripe From Around Here! 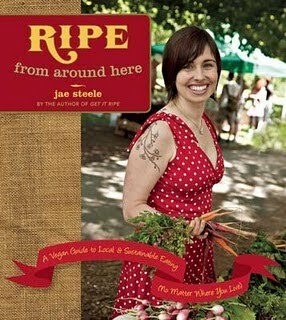 It was Steele's past experience working on small organic farms, her love of farmers’ markets and community-building, and the time she spent on the board of directors at her local food co-op that inspired the writing of Ripe From Around Here. The book underscores the importance of local, sustainable eating and living by helping readers deepen their understanding of organic and seasonal foods, and their positive impact on our health and our planet. While local foods is a big buzz phrase across the western world these days, Steele makes a point of providing an informative resource from a non-animal-consuming, vegan vantage point. Come for a delightful and stimulating presentation on just how to make more sustainable food choices, and sample some treats from the recipe section of the book!